Just as we are watchful of the ways we store our food items; similarly the effectiveness of a medication is relative to the conditions under which it has been stored. No doubt that most of us have the sense to check the expiry dates, but a large number of us still overlook the storage conditions that have to be implemented. The most common storage direction that most over-the-counter medications come up with is “store at room temperature” or “store in a cool and dry place”. This is because medications have one or more “active” ingredient as well as additives/ fillers that require being stored under those specifications. If not stored properly, chemical reaction may occur causing pills to become ineffective or even generate damaging byproducts. Different drugs have different time spans for degradation. In the case of food, we can mostly judge the shelf-life by just visually inspecting it. However, it is highly impossible to sense visual and taste alterations in inappropriately stored medications. To ensure maximum efficacy of a drug, care needs to be taken right from the time the medicine leaves the assembling unit up to the time of utilization of the item. The most widely encountered problem is change in temperature. "Controlled room temperature" is described by the U.S. Pharmacopeia (USP) as, "A temperature maintained thermostatically, that encompasses the usual and customary working environment of 20 to 25°C (68 to 77°F) that allows for brief deviations between 15 to 30°C (59 to 86°F) that are experienced in pharmacies, hospitals, and warehouses." Here are a couple of examples of what can go wrong if the drugs are not properly disposed off. Insulin which is a widely used drug loses its adequacy if it is frozen or kept under direct sunlight. Instead, it should be stored in the refrigerator. As a rule, anti-microbial medications and vaccines ought to be secured from direct sunlight and should be preferably stored in the freezer or the refrigerator. If stored improperly it can cause stomach or kidney problems. Protein based prescriptions like thyroid medications and oral contraceptives are vulnerable to temperature changes. Protein denatures with progressions in temperature. Ointments and creams may melt if the temperature is excessively high. For instance, Hydrocortisone cream can separate and render useless in high temperatures. Ensure that you adhere to the storage instructions properly. Keep your medicines in the hand baggage during air travel rather than having it checked in with your luggage. Make sure you practice the same during long road trips as well. Medicines should not be stored in excessively hot environments such as the trunk of the car. If your area experiences a lot of power cuts, it is more advisable to buy small amounts of the prescribed medicines rather than making a bulk purchase. Make it a point to buy medicines from pharmacies that have good air conditioning especially if you live in places with extremely hot or cold climates. Unlike what you have heard previously, storing drugs in the bathroom may not be a good idea. It may get excessively damp, and humidity may ruin your medications. You may have to search for other spaces in the room or corridor cupboards instead. 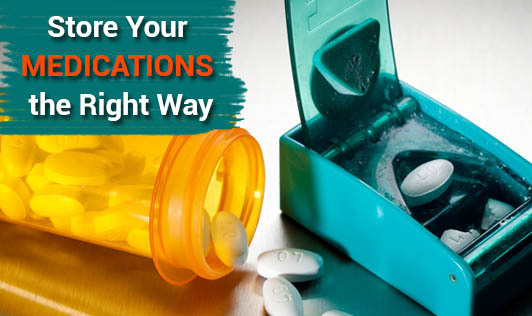 Do not remove medications from their packaging unless you are going to consume it right away. Make sure you store these in a cool dry spot. If you stay at places with extreme temperatures, make sure you don’t keep the drugs exposed to these temperatures for long time. If feasible, drive home straight from the pharmacy. Be wary so as to not take drugs which have changed color or consistency (regardless of the fact that it is well within its expiry date). Be cautious of any abnormal aroma. Dispose pills that are stuck together, or show other signs of physical progressions, in the same way as gel pills that have ended up harder or tablets that are mushier/softer than regular.